The exact nature of how Scripture functions as an authority for the church has long been a source of debate. The issue only seems to have become more intense with the onset of post-modern epistemology. How do those with a high view (inerrancy) to answer the challenges that are being raised by today’s world, from both outside and within the church. This is Vern S. Poythress’ focus in Inerrancy and Worldview: Answering Modern Challenges to the Bible. Unlike Beale’s The Erosion of Inerrancy in Evangelicalism, where the book primarily addresses the writings of Peter Enns, Poythress spends most of his time looking at the worldview that shapes the challenges against inerrancy. 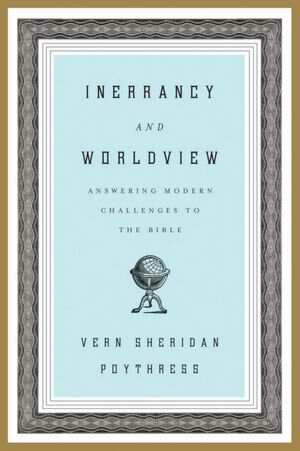 Inerrancy and Worldview certainly contains interaction with a variety of authors and leading voices, but the primary focus is on the thinking that Poythress believes brings about rejection of inerrancy. This approach is somewhat unique. I think most discussions about the nature of Scripture as God’s inspired word certainly include issues related to world views, but I’m unaware of any works that focus primarily on that issue. Poythress is to be commended for such a creative (and wise!) approach. Critics may take issue with a statement like this, but it’s important to recognize that Poythress is coming from an authorial intent hermeneutic. Thus, he is not arguing that the Bible teaches that the world is flat or a box (that’s why, in my opinion, the term inerrancy must always include a discussion on hermeneutics). What Poythress is chiefly concerned with is attacks upon the functional truthfulness and functional authority of Scripture. Wise readers will recognize that Poythress’ work will help Christians because it is not simply a focus upon the insider issue of inerrancy among evangelicals. Inerrancy and Worldview is much broader than that. Attacks upon the authority of Scripture come from a variety of worldviews and from different angles. Thus, Poythress believes that we need to consider the worldview and interact with how it shapes human thinking. I believe this is good pastoral advice. There’s both an acknowledgement of the necessity to do our homework and study hard and not move quickly beyond the issues in question. Yet we also have to acknowledge our finiteness and remember who God is.